The Owners of ULISTIC Built A Successful $5 Million MSP Business. Our goal is to help you do the same! Use ULISTIC’s 17-Step MSP Sales and Marketing Process to turn prospects into clients. It will provide you with practical information you can put to work immediately. Plus, this month we’re featuring world-renown Negotiating “Guru” Jim Thomas! Author of NEGOTIATE TO WIN! Learn How You Can “WIN” More Sales With Simple Negotiation Tactics! These days, successfully closing an MSP sale increasingly requires something that most IT professionals don’t especially like and don’t do very well: Negotiate! Mix in a struggling economy, brutal competition, and price-obsessed customers and vendors, and the conclusion is inescapable: It’s time to improve your negotiating skills! You can’t put this off any longer! Your net after tax profit would increase by 50%! Jim will show you how to do this, and– quickly and easily! Very few of your customers — and none of your vendors — are charitable organizations. If you expect them to be fair with you and look after your financial needs, you’ll not only be disappointed, you’ll be lucky to stay in business. Better negotiating starts and ends with you. How MSPs consistently leave money on the table with customers and vendors. The message that rate cutting sends to customers. How better marketing — not rate cutting — will make you more successful. How major trends in the economy have made negotiating skills more important than ever. How to distinguish persuading and selling from negotiating, and when to use each skill. How to overcome the anti-negotiation bias in North American culture. How to prepare more effectively for negotiations. How to competently employ a full range of best negotiating practices to result in your maximum advantage. Negotiating luminary and “America’s Negotiating Coach” Jim Thomas is a Washington, D.C. attorney, coach, consultant, speaker, trainer, media personality, and one of the most acclaimed and respected negotiators in the world. Jim is the author of the Pulitzer-nominated HarperCollins international bestseller, Negotiate to Win, and the founder and CEO of Common Ground. For more than three decades, top organizations have chosen Jim to negotiate their most important agreements. Jim has negotiated everything from mergers and acquisitions and international business transactions to environmental, labor, and arms control agreements. Jim is also an expert at making great negotiators: in coaching and consulting assignments and Negotiate to Win Workshops from Kansas City to Kuala Lumpur, he has shown tens of thousands of students how to negotiate their way to business and personal success. A frequent television guest and a popular speaker, Jim teaches at the University of Washington’s Pacific Coast Banking School, the Georgetown University Law Center, and Louisiana State University’s Graduate School of Banking. He’s a graduate of UCLA and the Georgetown University Law Center, and lives with his wife Jacqueline in Washington, DC and Sunset Beach, NC, USA. Jim’s Company — Common Ground Seminars, Inc. In less than two decades, Common Ground — a Washington, D.C.-based boutique provider of top-quality, highly customized negotiation coaching, consulting, training, and services — has become a global leader. Each year Common Ground performs hundreds of successful engagements worldwide, and its flagship program, the Negotiate to Win® Workshop, is one of the foremost negotiation training programs in the world. 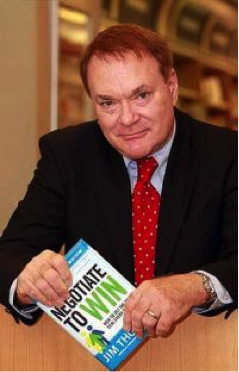 Based on Jim Thomas’s international bestseller Negotiate to Win, the Negotiate to Win Workshop has become the negotiation program of choice because it works. From the profusion of theories, traditions, strategies, and folklore, it features the priceless handful of negotiating techniques that succeed, again and again, in the real world, and packs them an exciting, no-nonsense program. The result: effective, hard-hitting training that produces immediate, measurable improvement in attendees’ negotiating skills.